‘Wilhelm the Grey’ is a toy animal which is connected to a computer, a crossing between a toy animal and a tamagochi. It’s meant for little children to learn what it takes to care after a real pet. So how does it work? You can divide ‘Wilhelm the Grey’ in two parts. You have the real toy animal, and the virtual pet. 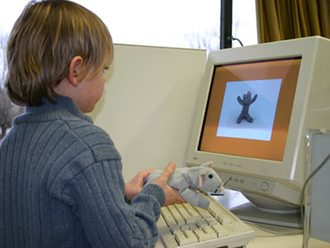 The toy animal can be petted or squeezed, resulting in a happy or sad virtual character on the screen. By pressing something against its nose you can also feed it, which triggers an eating animation. Wilhelm the Grey was made during the HCIP-course at the Royal Academy of Art (The Hague), part of the MSc Media Technology (Leiden University). You had to buy a cheap item, and make an interface out of it. Important was to come up with an idea as quickly as possible, and make the interface using easy technical solutions. Build into Wilhelm is a usb-mouse, using the scroll-wheel for the petting, and home made sensors for the squeezing.